Each year the Emergency Aid Coalition (EAC) helps thousands of people in Houston to meet their basic needs and attain self-sufficiency. Trinity is part of that effort. The Emergency Aid Coalition is designed to help those in our community meet their basic needs while promoting self-sufficiency. The EAC offers a variety of services and helps thousands of people each year. Throughout the year Trinity collects clothing and food for the EAC. Each Thanksgiving Trinity organizes a food drive for the EAC. Last year we collected a full pick-up truck load of food weighing approximately 1,000 pounds. The EAC is now serving about 300 sack lunches daily. That means that at least 600 sandwiches must be made every day. The EAC needs many more volunteers to help make these lunches. Individuals may volunteer on their own or get together a group of their friends to prepare sandwiches. Availability on a weekday morning is required. The grocery delivery program is also growing, and volunteers are needed to deliver groceries from the Food Pantry to homebound individuals. Currently the EAC delivers on the first Sunday and third Saturday of each month. Volunteers are needed on both days. 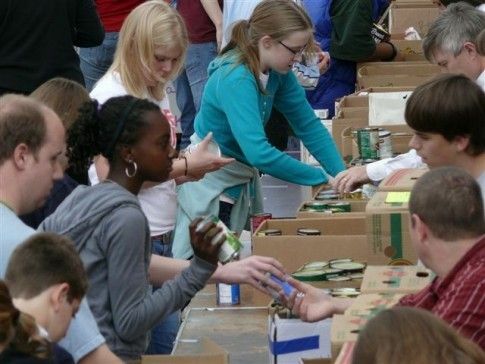 Interested volunteers may contact 713-528-FOOD or complete the volunteer form on our website at www.eachouston.org.